There can be few wildlife photographers in the northern hemisphere without at least one decent puffin picture. The bar is probably higher with puffins than with any other bird. 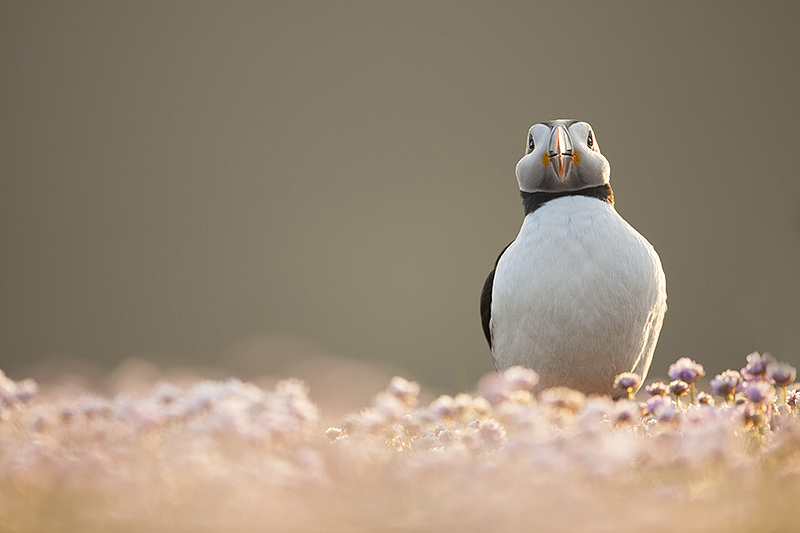 It is then even more important to find just the right place – lighting, background and viewpoint all play a part in just the right place – and our recent Puffin Bootcamp took us to the far north to just the right place: Fair Isle. Lying out on a limb 30-odd miles off mainland Shetland, Fair Isle is remote and if you suffer from travel sickness, not the easiest place to get to. Once there however, it’s puffin paradise and with almost 24-hour daylight (when it’s not raining), there’s plenty of time to really work this pint-sized seabird. A couple of evenings out of half-a-dozen gave us blissful light and with the vivid sea pinks in full bloom, it was down on our bellies shooting into the light. Puffins fly like bullets and to get decent flight pictures you need some help from the wind. With day after day of southerlies, the birds were landing side-on to us for the most part, but for a few hours on the final day we were treated to ‘down the barrel’ puffins and the sweet, inevitable sound of motordrives. We’re tentatively scheduling our next Puffin Bootcamp for 2016. It’s a long way, there’s a dodgy boat trip and you need to be able to rise early but if you want to indulge your photographic passion for puffins, drop us a line and we’ll take you to just the right place. The world can never have enough puffin pics! I really enjoyed the bootcamp last year, and I highly recommend it to anyone who would like experience a front row seat in the puffin world. Nice to hear from you Jennifer. They are such fantastic birds – 2nd year now following them on Skokholm .. such characters and as you say they fly like a bullet … I love how they Bill pretty much for everything and if two are at it then others come along to watch and try and join in …. Looks like a beautiful place ..
What a pleasure it was to be able to walk from the door and share time with these clowns of the sea. What a comfortable door it was to walk from. It was a real privilege to spend time on Fair Isle. Thank you for the introduction.